Our friend Daniel Horowitz, whose recent articles for Conservative Review help make the case for the impeachment of Federal District Judge James L. Robart, the federal judge who vastly exceeded his authority in restraining President Trump’s Executive Order temporarily pausing travel from seven terrorist hotspots, has a book-length explanation of what needs to be done to rein-in the federal judiciary and restore it to its proper constitutional role. Congress has plenary control over lower courts and the appellate jurisdiction of the Supreme Court. Congress can abolish the lower courts altogether and reroute their cases to state courts. Every aspect of the court system’s structure — administrative procedures, rules of adjudication, methods of interpretation, and logistics of proceedings — can be regulated by Congress in any way. And a good place to start would be to take immigration matters out of the hands of the federal district courts. The original lawsuit to block President Trump’s Executive Order on travel from terrorism hotspots was filed in Federal Court for the Western District of Washington, which is part of the Ninth Circuit; a hotbed of Far-Left judicial activism that is deeply hostile to the limited government constitutional order created by the Founders of our federal republic. This court is by far the most anti-constitutional circuit amidst a federal judiciary where the majority of the circuits don’t respect the Constitution as written says Horowitz. And, the Ninth Circuit is, by far, the most reversed appeals court in the country, making Anthony Kennedy look like James Madison in comparison says Horowitz. Most of the members of the Ninth have literally supplanted the written Constitution for an ever-elastic set of ethos that are anchored to nothing more than the political values of these unelected judges at the time they woke up that day. Our founders certainly feared that their experiment might result in the collapse into an executive oligarchy, but they certainly never envisioned powers of King George being wielded by a judicial oligarchy, much less a puny lower court existing at the pleasure of Congress concluded Horowitz. And Daniel Horowitz is right. Congress rightfully delegated restrictionist authority to the president under section 212(f) of the Immigration and Nationality Act in the clearest terms imaginable. And said Horowitz, that should end the discussion. Moreover, almost each component of the immigration order is double covered by another statute. Under existing law unanimously passed by Congress (8 U.S. Code § 1735), any foreign national from state sponsors of terror (at the time of the original law in 2002, that included five of the seven countries on Trump’s list) are not to be granted visas forever (not just for 90 days, as Trump has proposed). But here’s the real key to why we think Judge Robart should be impeached – President George W. Bush and Obama utilized waiver authority to bring in these people; Trump merely reinstated the base statute. Plus, Trump added Somalia and Yemen, which are even worse than state sponsors of terror; they are failed terror state safe havens with absolutely no data on immigrants. It would be a violation of the social compact for a president to allow immigration from those countries. Trump has the statutory authority to do what he did. Period. And Judge Robart had nothing but personal whim to justify his arbitrary and capricious ruling restraining the President’s Executive Order. As things stand now the ruling by Robart, who suspended the temporary pause, will remain in place, unless the Supreme Court overturns it. But, as with most politically charged matters, the Supreme Court is in a 4 to 4 deadlock on immigration giving the Ninth Circuit Court of Appeals control of our national immigration policy. Today, as Democrats in the Senate plan an indefinite filibuster against the nomination to the Supreme Court of 10th Circuit Court of Appeals Judge Neil Gorsuch that 4 to 4 deadlock remains in place. So, all Democrats have to do is keep filibustering Judge Gorsuch to overturn the clear meaning of Articles I and II of the Constitution, over 200 years of precedent and the laws passed by Congress to keep the door open to millions of potential terrorists – and claim the powers the Constitution grants the President. This means that for all intents and purposes the President’s powers as Commander in Chief and his executive power to maintain the country’s sovereignty have been stolen by an unelected judge in the Western District of Washington. 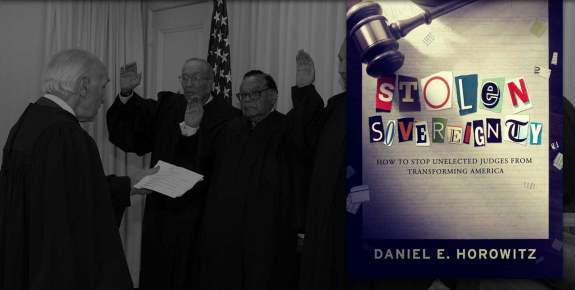 We strongly recommend Stolen Sovereignty by Daniel Horowitz for an explanation of how We the People can recover the sovereignty stolen from us by judges like James L. Robart, and why judges like James L. Robart should be impeached. Submitted by Charles Martel on Wed, 02/08/2017 - 13:37. Given the Leftist, activist bias of the 9th Circus and at least four Supreme Court justices, I suspect that the best thing for the Trump administration to do would be to rescind the Executive Order in question (thereby mooting all litigation over it), and issuing another executive order suspending the issuance of ALL visas to anyone from any country (no "discrimination" there), until a proper vetting system is in place. The Left, and particularly Leftist tech corporations that depend heavily on foreign skilled labor, would scream and throw a fit (so what else is new? ), but there's nothing they could legally do about it.